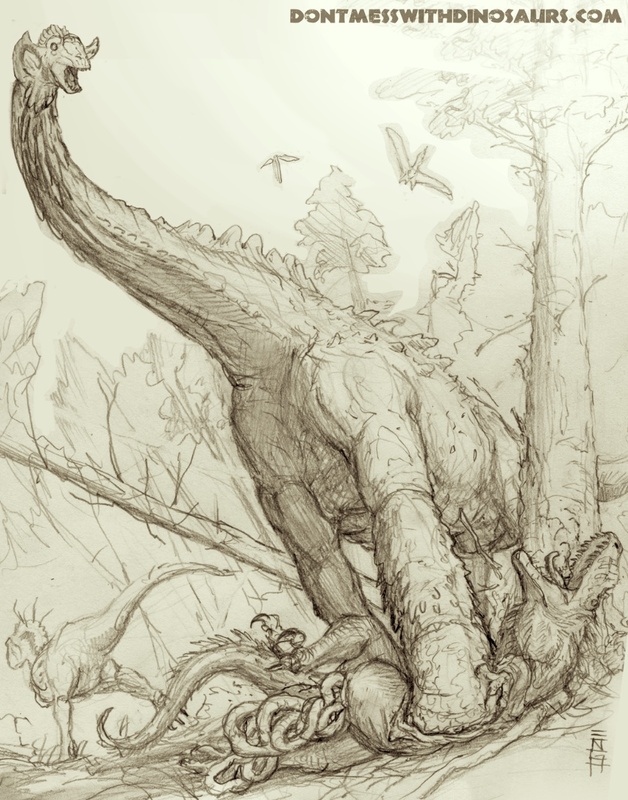 Because “here’s that Brian Engh sketch of a sauropod literally stomping the guts out of a theropod you ordered” was a bit ungainly for a post title. Here we have Futalognkosaurus sporting some speculative soft tissues, smooshing some very non-speculative soft tissues out of SeriouslywhogivesacrapwhatitisImjustgladitsdyingvenator. If you just look at the theropod’s face and not the…other stuff, you can imagine that maybe it is laughing. “Oh, ha-ha, you found my tickle spot! Hahaha, stop it! HAHAHA TOO MUCH AAIIIIEEEE–” Schploorrchtbp!! Brian drew this just because we’ve been living up to our mandate lately and posting pictures of sauropod vertebrae. So clearly we gotta do more of that. For more posts with Brian’s art, go here. Nice, but I don’t see the open mouth of the screaming pterosaurs and the erupting volcano. Rockin’. This is of course not the first or even second time we’ve featured the Sauropods Stomping Theropods theme on this site, but it’s great to finally see a piece in which the theropod is getting utterly trashed rather than merely squished. Is that a Dawn Redwood, Metasequoia, some 20 Ma ahead of its time? How did it get from Appalachia to the western fragment of Gondwana? Are you proposing that Futalognkosaurus survived to the end of the Cretaceous and developed a seafaring culture? although i realize now in my hasty attempt to push the perspective a bit i think I kinda goofed up the proportions of the sauropod leg squashing the would-be predator. sorry about that. FWIW, it looks fine to me. Forced perspective covers a multitude of sins. Is that a Dawn Redwood, Metasequoia, some 20 Ma ahead of its time? Did Metasequoia spring forth fully-formed from the forehead of Zeus? Did it possibly evolve from a similar-looking ancestor? Have two trees ever converged in morphology before? Are you proposing that Futalognkosaurus survived to the end of the Cretaceous and developed a seafaring culture? Yes. Lognkosaurs were the arks and carriers, intelligent dromaeosaurs were the crew, other taxa served as landing craft and so on. The sea battles between different cultures were epic. no. i did not do any research and there is no deeper meaning. this is just a picture of a titanosaur completely smashing a theropod. HARD. araucaria can look roughly like that anyway. I like the other theropod departing hastily, too. Are those external ears, or just display crests, on Futalognkosaurus? thanks. i was thinking they were flappy display structures when i drew them. something like a cobra’s hood. The only big theropod in the Portozuelo Formation is Megaraptor, so that’s probably what the mystery theropods represent. And the most fanboyishly-named theropod getting smashed by a nigh-unpronounceable “helpless prey item” is epic. No offense intended. I just wanted to write “and developed a sea-faring culture”. We have so few opportunities to use that expression. … but if that’s an impossibility we can settle for calling them poorly drawn megaraptors.